We are visiting a Himba village in Namibia near the Angolan border. Our guide has arranged a visit to a tribe that doesn’t see many tourists, and giggling children dance around us while curious adults watch from the doorways of mud huts. Our subject, a striking young woman with colorful necklaces, is happy to pose for a few images in the doorway. Through the use of an interpreter, and showing her images on the camera LCD screen, she gets more comfortable and even starts laughing at our excitement. We only have a few hours to visit this village, and while we would like to stay longer, we really want to create some compelling portraits of this unique experience. “Oh, this is really good, great job,” I say to Maureen, a workshop participant, as I review the images on her camera. She has just captured a terrific portrait of the Himba woman, and from start to finish it took less than five minutes. This photo was shot with an 85mm lens at ƒ/1.4, which provides a nice shallow depth of field to blur the hands of this monk. Great portraits are possible with minimal gear and limited time. 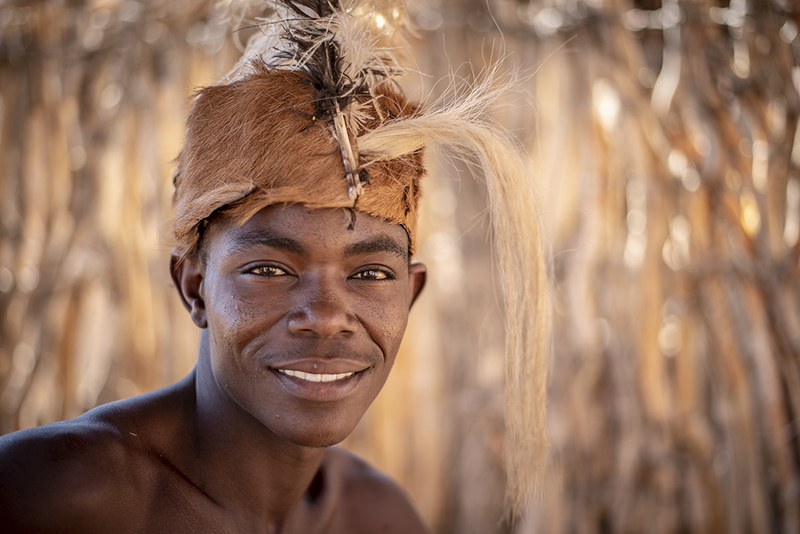 Whether you are snapping shots of your family vacation or photographing denizens of the Namibian desert, use these tips and techniques to help you capture great portraits on the run. A lot of travel portrait success depends on how comfortable your subject is and the amount of access you have. First research the country you are visiting, and learn about their culture and customs. Consider hiring a guide, especially if there is a language barrier. Guides are invaluable for getting you access to people and events you would never find otherwise. A smile goes a long way when you are asking permission to photograph someone. And even if you don’t speak the language, showing them the image playback on your camera will break the ice. I often bring a small Lomo instant-print camera that produces prints on the spot. Giving your subject a tangible print is a nice gesture and really opens doors. Positioning your subjects to one side of an image can create a more dynamic portrait. Take a good look at the location where you want to create your portrait. Clean, simple backgrounds will allow your subject to stand out. But one splendid aspect of travel photography is interesting backgrounds that create powerful environmental portraits. Find a background that tells a story about the subject…where they live, what they do. Just as important as finding a good location is posing your subject. Are they going to be looking on or off camera? How can you make them feel relaxed in a short amount of time? One approach to helping your subject relax is posing them with a friend or family member. They will feel more comfortable, and after a few frames, you can try photographing them by themselves. Pay attention to your subject’s hands; they will reveal if your subject is tense or relaxed. Straight, stiff poses generally don’t look good, so having your subject tilt their head just slightly left or right will make them appear more relaxed. See what your subject does naturally, and incorporate this aspect into your portrait. I’ve encountered stoic subjects who want to look off into the distance, while other people look straight into the camera without blinking. I like to strike up a conversation and find out more about my subject and their daily lives. Showing genuine interest in your subject will often put them at ease and give you more varied portrait opportunities. If you have an instant-print camera, take a picture and give it to your subject. Once they see what you are interested in doing, they will be more open to simple posing suggestions. 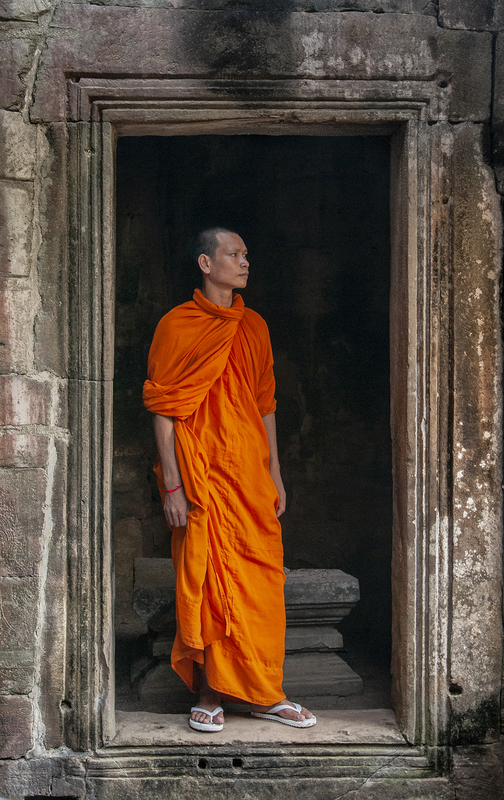 Doorways and windows can provide intriguing compositional elements to frame your subjects, like in this image of a monk from Cambodia. Consider your approach. Depending on your situation, photographic style and end-use of your image, you may not want to move or pose your subject at all. You can still create beautiful travel portraits without engaging your subject. It comes down to your style and approach. Be patient and look for interesting scenes where you can find locals going about their everyday lives. Are you more interested in documenting the scene or engaging your subject? Personally, I like contact with my subject, and this is an important part of the photographic experience for me. I hope my images reflect that moment of trust and communication between the subject and myself. Beautiful portraits hinge on a photographer’s awareness of light. And natural light offers a range of choices and qualities. I like to tell my workshop participants that I am a “light optimist.” It doesn’t matter if it is bright and sunny or gray and overcast, there is “great” light in the scene. A good photographer will evaluate the light and find subjects that photograph well in those conditions. Or they will modify the existing light to create a better photograph. Overcast light is the easiest to use in portraits. Your subject won’t be squinting in the sun, and colors will saturate. When capturing portraits, like the one at the beginning of this article, it can be helpful to crouch down in order to get on the same level as your subjects. This is particularly useful when shooting children and toddlers. One advantage of overcast skies is you can photograph your subject in almost any position or location without worrying about sun in their eyes or unflattering shadows on their face. If you want a blown-out high-key look, position your subject so you include white skies in the background. If you find the white too distracting, find an interesting background that doesn’t include the sky. Bright sun opens up a lot of creative choices for portraits. First, you have to position your subject so they are comfortable and not squinting. I like to stand where I will have my subject standing and see if it is comfortable. Positioning the sun behind your subject will create nice rim lighting on their hair and shoulders. Watch your exposure; you may have to open up and add light to get the correct exposure on backlit subjects. Early-morning light is warm and beautiful for portraits. Midday light is less flattering but can work. Try using a simple, white popup reflector to bounce some light back onto your subject. I use a 32” Rogue soft silver/natural white reflector, which easily fits in my photo backpack. This reduces contrast and adds nice catchlights in your subject’s eyes. Only reflect the light when you are ready to photograph; you don’t want your subject melting in strong reflected light while you change lenses. If the sun is too harsh, start looking for shade. But remember, not all shade is created equal. Open shade, with nothing directly over the subject, produces soft light but still has some contrast. Look closely at your subject for unattractive shadows beneath their eyes and nose. Get in close to your subject when capturing portraits. 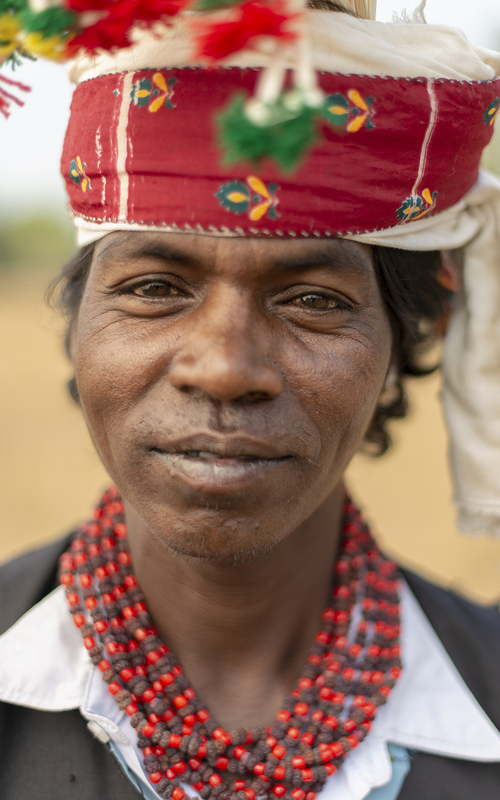 It allows you to focus on every nuance of your subject’s expression, like in this one of a man from India. I prefer covered shade over open shade. By positioning your subject under an awning or tree, the light is evened out and looks better on your subject. Doorways are a great portrait location because they offer covered shade and often have dark backgrounds to create nice separation for your subject. If you can’t find covered shade, create your own. Try using a translucent reflector with diffusion material: It will diffuse the light and create beautiful soft light on your subject. What do you think is more intimidating to use in photographing a shy subject, a reflector or speedlight? Reflectors seem simple and low maintenance (which they are), but to your subject, they are a large white disk attracting everyone’s attention in the street. On the other hand, a small speedlight in your hand barely gets attention. I’ve found a speedlight is less intrusive and often easier on my subject’s eyes. Experiment with both lighting choices and see what works best for your travel portraits. For quick portraits, I use TTL (through-the-lens) mode. TTL flash works in conjunction with your camera meter and sets the flash exposure. TTL flash is very helpful for quick portraits, especially if your subject is moving around. You may not have time to manually meter the flash exposure. And speedlights offer another big advantage; an independent light source from the sun. Using a flash allows you to set your background ambient exposure to different levels while the flash will provide correct illumination on your subject. I might set my ambient exposure two stops underexposed for a dramatic, moody background. My normal setup for quick travel portraits is one Nikon Speedlight SB-5000, a Nikon WR-R10 radio wireless remote, a small translucent reflector and a set of Rogue colored gels. Here, I used my Elinchrom ELB 500 to provide some additional fill flash for my portraits. 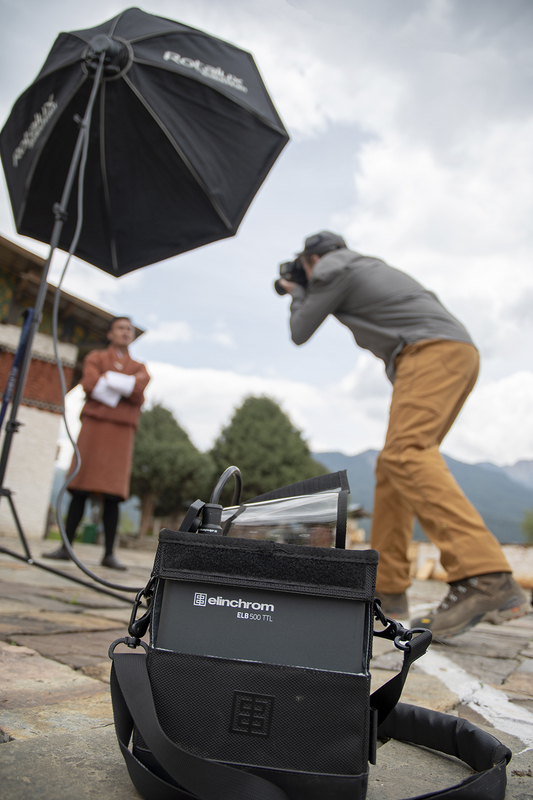 It’s a small battery-powered studio flash that weighs just 5.5 pounds. The SB-5000 is radio triggered, so bright sun won’t interfere with the signal. The same translucent reflector I use to diffuse the sun can also be used to diffuse my speedlight. I just shoot the speedlight through the reflector (with a friend holding it). The Rogue colored gels have some CTO (orange) colors I often add to my flash to warm up the light. All these accessories fit easily into my pack for a day of shooting. The transformational qualities of flash are considerable, and depending on your travels, you might even consider bringing a slightly larger, more powerful flash. If I anticipate a lot of portraits on my trip, I will bring my Elinchrom ELB 500 TTL flash. This small battery-powered studio flash weighs 5.5 pounds, operates in TTL mode and is perfect for quick shots on the road. The advantage of using a more powerful light (about eight times more powerful than a speedlight) is being able to use bigger softboxes and speedy flash recycling. I love using a large 39-inch octabox with portraits. The light is very soft, and I can still overpower the daylight using this powerful flash. 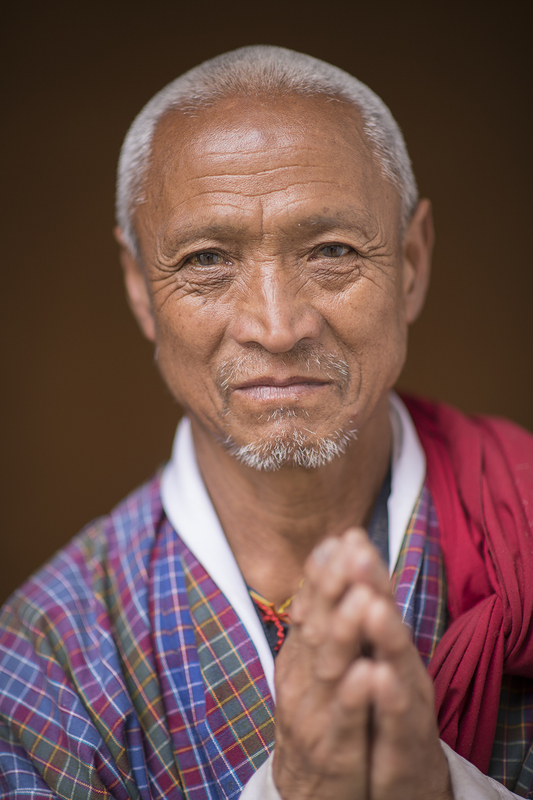 On a recent trip to Bhutan, I photographed monks using this setup. 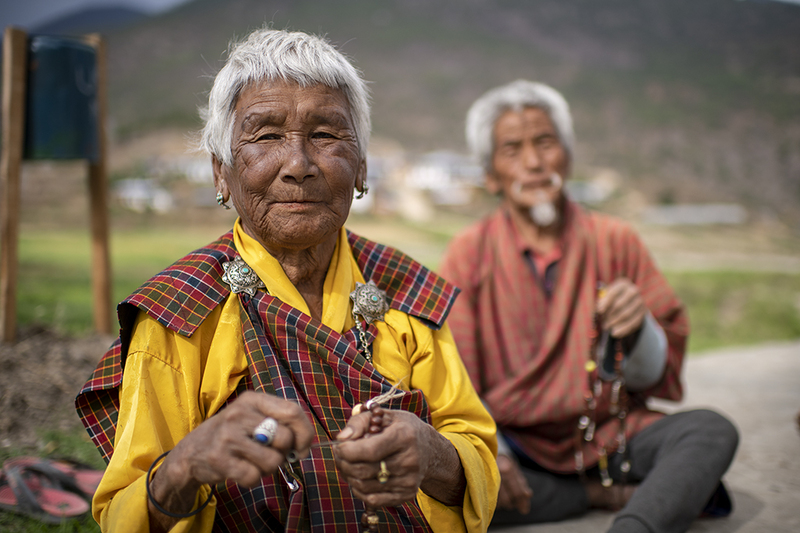 It was more to carry, but the large, soft light was perfect for capturing the spirit of the Bhutanese people. I’m headed to Tasmania in a few weeks. I know this island has dramatic landscape and exotic wildlife. But what about the people who live there? I have to tell the story about the fisherman, craftsmen and local residents. And to do that, I will need to take portraits on the run.